Guess what? We also do stationery! And we don't just find invitations that might work, we create them from scratch. That's right. 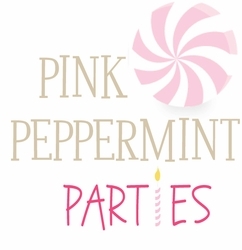 Along with your custom Party Plan as described in our Just a Taste Plan, Pink Peppermint Paper will create 2-3 customized invitation options. That also includes 2 thank you note design options and 2 favor tags options-all complete with suggested text carefully crafted by a professional copywriter. Once again, you simply give all the sweet details (type, venue, scoop on the guest(s) of honor and other pertinent info) by leaving it in the comments section at checkout. If we need seconds, we'll email you a basic questionnaire. We estimate you will receive your custom By the Slice Party Plan via email in fifteen business days or less from the time we receive your party details. **Please note that the cost associated with printing or shipping custom stationery is not included in this fee. ** Prices start at $1.60 each for invitations and thank you notes and $10 for a page of 9 favor tags with additional pages at a discount. Shipping charges are reasonable and are applied at flat rates based on order volume.